Since I'm moderating a panel with several MIT Media Lab professors in early September, including roboticist Cynthia Breazeal, I had brought home my copy of her book to read a few chapters on her basic research. 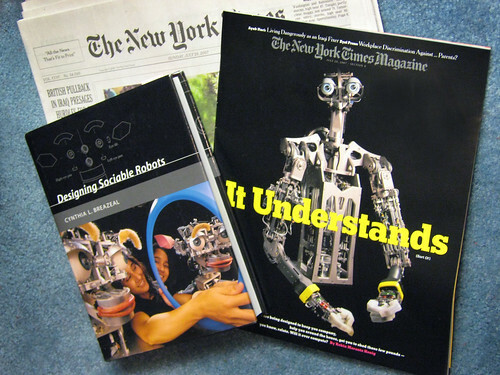 Coincidentally, the New York Times Magazine ran a cover story this weekend on robotics at MIT. There's good coverage on one of their newer robot projects, Cory Kidd's weight maintenance coach which I've been following with photos on Flickr. Both Cory's and Dan Stiehl's huggable theraputic teddy bear robots will be on display in the exhibit hall at AARP's National Event in Boston September 6-8, 2007. The NYT article is already behind advertising pages and a registration wall, but you'll likely find a copy at the MIT Media Lab Personal Robotics site or on the press page in the next few days.